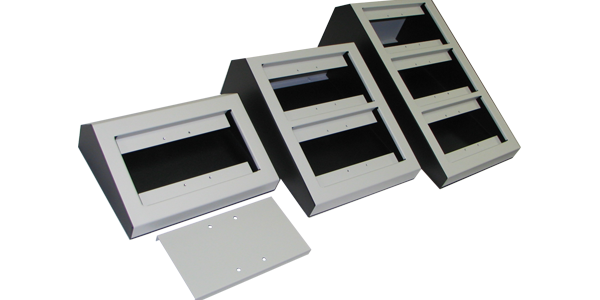 The Tech Works AN-DM-1, AN-DM-2, AN-DM-3, and the AN-Blank are designed to allow our standard wall mounting tone visual displays to be Desk Mounted in an attractive console. The DM-1 has 1 bay for a single annunciator panel, the DM-2 has bays for 2 panels and the DM-3 has 3 bays. Any of our standard CC-AN or NC-AN products fit in the cut outs using standard mounting screws. If you have an unused bay in a console, simply cover it with an AN-Blank, and the customer has room for future expansion. These units are made of 18-gauge cold rolled steel and finished with textured powder coat paint. The bottom of each unit is Black while the top is a Light Gray. Wiring is accomplished through a hole in the back of each chassis. The hole comes with a rubber grommet to protect the wire. Simply run your wire just like you would for a wall mounted installation.